Now with development of Oxygen Botanicals Specialty Foaming Gel Cleanser B, dead skin cells are can now be gently washed away as this cleanser fully removes all presence of makeup, dirt and oil that's accumulated from the day. Nothing thoroughly cleanses your skin like a quality specialty cleanser that exfoliates dead skin and restores moisture back into the skin. You can now have the skin you've always loved and dreamed of, by saying yes to rejuvenated skin with Oxygen Botanicals Specialty Foaming Gel Cleanser B. It removes dead skin cells and restores your skin's luster and tone. In fact the tone becomes even and the skin texture becomes smoother. The Oxygen Botanicals Specialty Foaming Gel Cleanser B. restores your skin's natural moisture balance, as it is left intact while a whole new fresh radiant complexion emerges. With ingredients such as Linden Extract your skin feels soothes and calms the skin, providing moisture to the skin and blocking the skin from experiencing future breakouts. Sensitive skin becomes nurtured by this gentle yet powerful foaming gel cleanser. If you want to give your skin the royal treatment it deserves, why not try Oxygen Botanicals Specialty Foaming Gel Cleanser B. It works well on all skin types as it clears skin breakouts, add moisture back to the skin, thoroughly removes dirt, oil, and makeup all while maintaining the perfect balance of moisture in the skin. 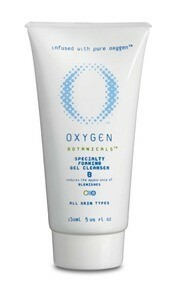 Yes the Oxygen Botanicals Specialty Foaming Gel Cleanser B has a variety of uses. It helps fade the appearance of blemishes while improving the overall complexion of the skin. To apply, use on damp skin, applying a small amount of the foam cleanser to the palm of your hand to create a rich lather. Use on skin in a circular motion until the skin feels smooth and clean. Rinse with water and pat dry. This process can be followed with your normal skin care regimens.